Designer heavy work lehenga in beige net designed with embroidered Zari, sequins, crystals and heavy foliage patterns with patch border work. The designer choli is unstitched. Comes with a contrast dupatta. 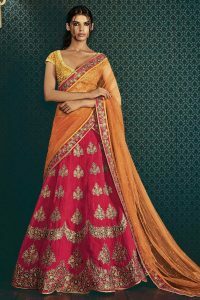 Lehenga choli comes with unstitched material. This can be stitched using the tailoring options select “Custom stitching” or “Ready Sizes” option with a step by step guide. If there are any design changes to be made you will be emailed from our stitching team stitching@omsara.co.uk subject to design limitations. The blouse can be customised to fit sizes 34,36,38,40,42 (Slight variation in colour, fabric & embroidery work is possible. Model images are only representative.) Model accessories and latkans are not included.